Root canal therapy involves removal of vital and necrotic pulp, infected dentin, and debris to eliminate microorganisms. ,, Enterococcus faecalis endures chemomechanical instrumentation and intracanal medication to proceed to remain viable within the dentinal tubules. , Hence, efficient delivery systems such as the Endovacm, Stropko Irrigator, and Diode lasers ,, have been developed. Combination therapy using irrigation solutions together or in succession has been reported to be more effective for canal disinfection. The purpose of this study was to evaluate the efficacy of different irrigation delivery systems in combination with 5.25% NaOCl in disinfection of the root canal. Forty noncarious mandibular premolar teeth extracted for orthodontic purpose, were selected for the study. The presence of a single canal was determined radiographically with digital radiographs taken at different angulations. The teeth with open and resorbed apices, grossly carious teeth, and teeth with fractured roots were excluded from the study. The teeth were disinfected according to Occupational Safety & Health Administration (OSHA) regulations, 2004. Crowns of the teeth were transversally removed with high speed diamond disc. Working length was determined with the help of digital radiograph and prepared by serial preparation to a #30 K file, with saline as an irrigant; for easier inoculation of bacteria. Two coats of nail varnish were applied to seal the apex. The canals were dried with paper points and sterilization was achieved by gamma irradiation. The teeth were inoculated with bacterial strains of E. faecalis (ATCC 29212) and the teeth were incubated for 24 h. A suspension of 50 μL of E. faecalis strand was incubated in 5 mL of brain heart infusion broth culture medium in 37°C incubator for 24 h. The concentration of inoculation was then adjusted for a degree of turbidity according to McFarland scale which corresponds to bacterial concentration of 3 × 10 8 cells/ml, and corresponding to optic density of 550 nm. The root canals were filled with inoculation and were incubated for 21 days at 37°C in an incubator. All samples had a portion of inoculation transferred in 5% sheep blood Trypticase Soy Agar (TSA) plates to check E. faecalis bacterial growth at several time periods, with a result of 100% positive. After incubation, the contaminated roots were randomly divided into four groups (n = 10) according to the disinfection regimen used. Teeth were randomly divided into four groups; all 40 samples were inoculated with E. faecalis for 24 h at 37°C and all the steps were conducted under sterile conditions. The first group of 10 samples served as the control group; the second, third, and the fourth group; the experimental group each containing 10 samples each. This group comprised of the teeth which were cleaned and shaped, inoculated with strains of E. faecalis, but no irrigation was done. This group served as the control group. The teeth were irrigated with the Stropko Irrigator system. Irrigation was performed after attaching the Stropko Irrigator to the air/water syringe. The canal was flooded with 5.25% sodium hypochlorite and it was activated with the help of an endoactivator which is known to produce a tsunami effect causing flushing action in the canal. The canal is then reflooded with sodium hypochlorite and then the fluid is evacuated. Air pressure to air/water syringe must be properly regulated, it is usually 30-50 lbs. For air-drying in endodontic canals, it must be reduced to 1-3 lbs. After disinfection, paper points were used to collect the samples from the teeth and were placed in brain heart infusion broth in microtubes and incubated for 24 h. The samples in the microtubes were transferred to the Petri dish More Detailses containing Muller-Hilton diffusion media using a nichrome wire loop and incubated for 24 h.
The results obtained were statistically analyzed using the chi-square test. The mean CFU for all groups were: Group 1 = 10 8 per ml, Group 2 = 10 3 per ml, Group 3 =10 5 per ml, and Group 4 = 0. Statistical analysis demonstrated statistically significant differences between the laser irradiated group (Group 4) and the Endovac and Stropko group (Groups 2 and 3, respectively), and control group (P < 0.05) [Figure 1]. The degree of disinfection for experimental groups, in relation to Group 1-control, which presented total contamination; Group 4 demonstrated 100% disinfection; and Groups 2 and 3 demonstrated 50 and 20% disinfection, respectively. A study done by Manikandan et al., concluded that E. faecalisforms biofilm at various pH (7.3-12.3) and sodium hypochlorite have greater antimicrobial effect than chlorhexidine on E. faecalis biofilm. The effectiveness and safety of irrigation depends on the means of delivery; hence an increasing number of novel needle-tip designs and equipment are emerging in an effort to better address the challenges of irrigation. 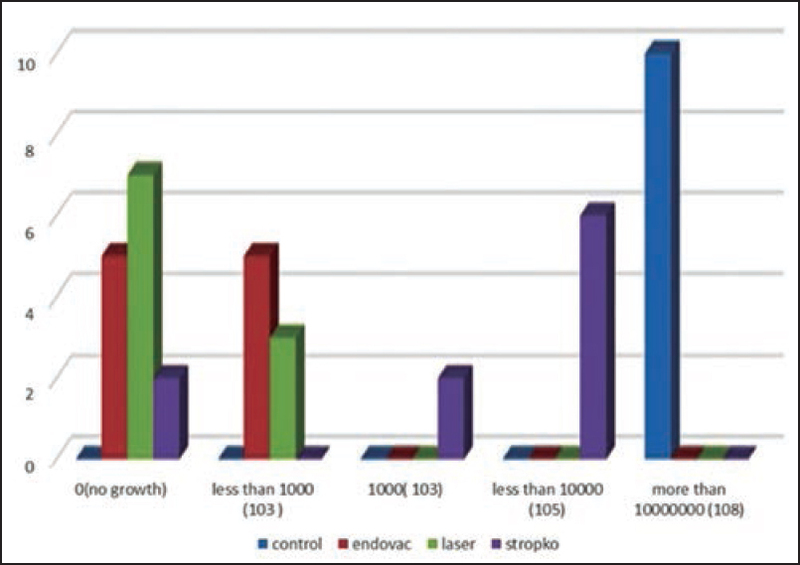 In the recent times, lasers have shown great promise in the field of endodontics and studies have demonstrated the bactericidal effects of diode laser in root canal disinfection. Moritz et al., has reported that an 890 nm diode laser was able to disinfect the root canal walls. However in the present study, wherein a 980 nm diode laser was used in conjunction with 5.25% sodium hypochlorite; the reduction in the colony forming units was found to be significantly reduced as compared to the control group. The present study is in accordance with the study done by Hockett et al., which concluded that the Endovac hadthe ability to remove bacteria more effectively from root canals than traditional irrigation system. Studies by Siu and Baumgartner, Mitchell et al., have also reported that the Endovac System is safer and is more effective in cleaning the root canal especially in the apical third. , Although with Endovac there was significant reduction of the bacterial load, it is just a mechanical aid in irrigation and does not have any antibacterial properties by itself like lasers. Stropko irrigation system introduced by John Stropko is an instrument used for precise control of delivery of irrigants in any dental procedure. In the present study, we used Stropko Irrigator in conjunction with 5.25% sodium hypochlorite solution, wherein we found the colony forming units to be reduced to less than 10 5 per ml as compared to the control group where the colony forming units were more than 10 8 per ml. Effective irrigant delivery is prerequisited for successful endodontic treatment. In this study, laser group resulted in significantly higher antimicrobial effects compared with the Endovac and Stropko irrigation groups when in conjunction with sodium hypochlorite. The diodelaser irradiation may be apossible supplement to existing protocols for disinfection of the root canal system as the penetrating properties of laser light may allow a bactericidal effect beyond 1 mm of dentine. However, further studies are required along with other irrigating solutions are required to determine an ideal irrigating regimen in endodontics. We would like to acknowledge the Nitte University Central Research (NUCSER) lab for helping carry out the research work. Siqueira JF Jr, Araújo MC, Garcia PF, Fraga RC, Dantas CJ. Histological evaluation of the effectiveness of five instrumentation techniques for cleaning the apical third of root canals. J Endod 1997;23:499-502. Silva Garcez A, Núñez SC, Lage-Marques JL, Jorge AO, Ribeiro MS. Efficiency of NaOCl and laser assisted photosensitization on the reduction of Enterococcus faecalis in vitro. Oral Surg Oral Med Oral Pathol Oral Radiol Endod 2006;102:e93-8. de Souza EB, Cai S, Simionato MR, Lage-Marques JL. High-power diode laser in the disinfection in depth of the root canal dentin. Oral Surg Oral Med Oral Pathol Oral Radiol Endod 2008;106:e68-72. Schoop U, Kluger W, Moritz A, Nedjelik N, Georgopoulos A, Sperr W. Bactericidal effect of different laser systems in the deep layers of dentin. Lasers Surg Med 2004;35:111-6. Sperandio M, Souza JB, Oliveria DT. Effect of gamma radiation on dentin bond strength and morphology. Braz Dent J 2001;12:205-8. Hockett, JL, Dommisch, JK, Johnson, JD, Cohenca, N. Antimicrobial efficacy of two irrigation techniques in tapered and nontapered canal preparations: An in vitro study. J Endod 2008;34:1374-7. Mithra NH, Krishna RS, Shishir S, Veenna SA. Comparative evaluation of bactericidal effects on Enterococcus faecalis using diode laser irradiation, sodium hypochlorite and chlorhexidine gluconate irrigation; An in vitro study. Oral Health Dent Manag 2013;12:145-50. Siqueira JF Jr, Rôças IN, Favieri A, Lima KC. Chemomechanical reduction of the bacterial population in the root canal after instrumentation and irrigation with 1%, 2.5% and 5.25% sodium hypochlorite. J Endod 2000;26:331-4. Manikandan R, Hegde MN, Shetty N, Geethashri. A comparative evaluation of biofilm formation ability of E. faecalis in alkaline conditions and its susceptibility to endodontic irrigant regimens - An in vitro microbiological study. J Dent Med Sci 2013;4:49-52. Moritz A, Beer F, Goharkhay K, Schoop U. Laser Supported root canal sterilization. Oral Laser Application. 1st ed. Chicago, IL: Quintessence Publishing; 2006. p. 254-77. Preethee T, Kandaswamy D, Arathi G, Hannah R. Bactericidal effect of the 908 nm diode laser on Enterococcus faecalis in infected root canals. J Conserv Dent 2012;15:46-50. Castelo-Baz P, Martín-Biedma B, Ruíz-Pifión M, Rivas-Mundiña B, Bahillo J, Perez-Estévez. Combined sodium hypochiorite and 940 nm diode laser treatment against mature E. Faecalis Biofilms in-vitro. J Lasers Med Sci 2012;3:116-21. Nielsen BA, Baumgartner JC. Comparison of the EndoVac system to needle irrigation of root canals. J Endod 2007;33:611-5. Siu C, Baumgartner JC. Comparison of the debridement efficacy of the EndoVac irrigation system and conventional needle root canal irrigation in vivo. J Endod 2010;36:1782-5. Mitchell RP, Yang SE, Baumgartner JC. Comparison of apical extrusion of NaOCl using the EndoVac or needle irrigation of root canals. J Endod 2010;36:338-41.